Marino di Teana was a man of many angles. Born in 1920 in the medieval village of Teana, Italy, he lived and worked as a shepherd when he was very young and was raised mostly by his grandparents after his father ran off to Argentina. He led an isolated childhood, amusing himself by drawing on the walls of the barn where he played alone by day. When his grandparents couldn’t afford to send him to school, they arranged for him to apprentice with a decorator from Naples and then with a master mason. He worked hard and became adept at making his own tools, forging them himself. When he was 16, di Teana went to live and work in Argentina, reuniting with the father he barely knew and who wanted him to be an architect rather than a starving artist. But following years with a brutal work schedule—he even recalled helping build coaches for Peron's labor festival—during which time he also took night classes, he escaped to Europe, spending time in Spain, Italy, and France, chasing art, architecture, and art history. He wrote that Europe would give him the opportunity to see the arts in their own setting. “A piece of carved stone,” he wrote, “is really beautiful only in its relation to the church, to the village, to the country.” This seems like a maxim governing all of his work—its physical and cultural context. What is fascinating about di Teana is how familiar his work seems at first look and yet how difficult it can be to place, attributable perhaps to the fact that he fits comfortably in several genres and time periods. All sorts of odds and ends made their way into his art, from the drawings he made as a child, including obsessive sketches of Mussolini, to his compulsively executed sculptures. “I was constantly messing in clay,” he recalled. He would also pick up and store rocks and build with them. "The walls of the barn, the ground floor were full of my drawings: faces, houses. I did them with a nail or a pencil. As for my sculptures, I let them wear away and go to pieces out in the fields. The important thing was to make them." 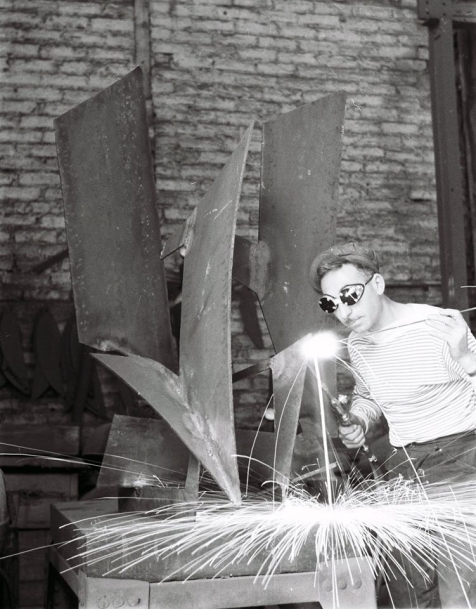 One is first struck by his affinities with artists and architects of his own French generation—Nicolas de Stäel, in the painterly, sculptural, and architectural aspect of his work, as well as the painters Serge Poliakoff and Hans Hartung in the structuring of his sculptures and buildings and their internal perspectives. But even more striking are the associations with sculptors Julio González, Alberto Giacometti, and Jacques Lipchitz, although di Teana’s works often have a tighter, more formal structure. A couple of Marino di Teana's corten steel sculptures on an estate in Southampton. Photograph by Michael Mundy. Di Teana's Liberté in plan and in miniature. One thinks, too, of sculptor-architects like Eero Saarinen, with his stone landscapes—notably, of Morse and Ezra Stiles Colleges at Yale University, where towers stand tall among low rising buildings as a form of punctuation—landscape sculpture. 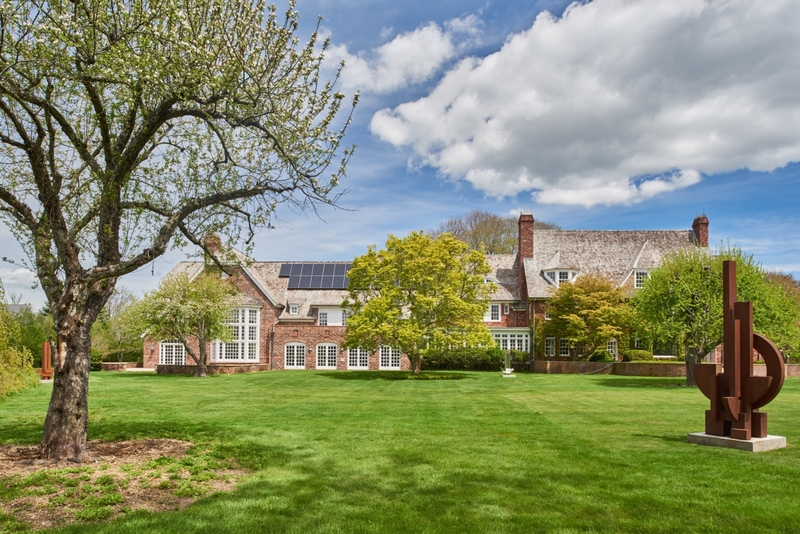 And then, there are some affinities with less-known modernist architects like Grosvenor Atterbury, whose quietly sculptural shingle-style houses, with allusions to the Mediterranean as well as to Long Island vernacular architecture, mix styles and interact symbiotically with the surrounding landscape. The elements of Modernism in di Teana’s sculptures touch on Eastern motifs as well. 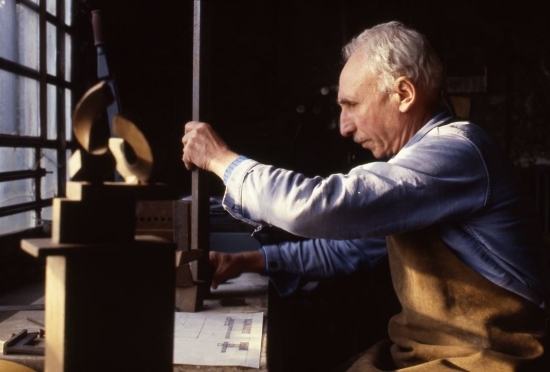 We sense the aura of Frank Lloyd Wright in the non-fussy sense of craft and with the strong influence of Chinese and Japanese design, popular in the thinking and designing of 20th-century artists and architects—the solid, flat, often broken spheres with holes in their centers. 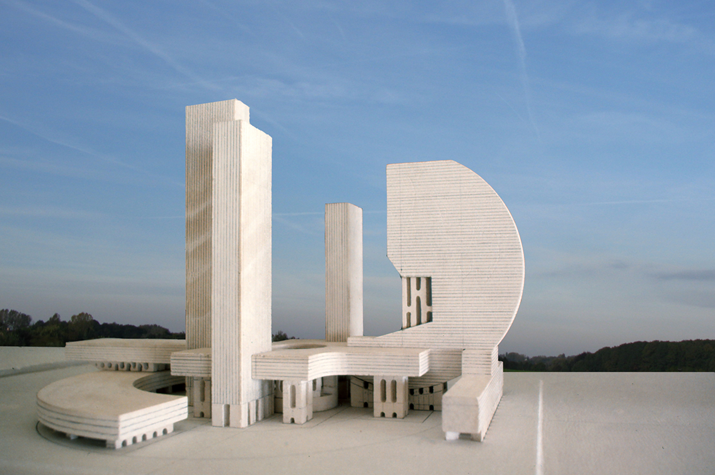 From the high-rising, skinny Gothic structures emerging from gardens and landscapes, looking like stone and/or iron growths themselves, to the cubistic, structures with cut-out curves reminiscent of Le Corbusier, the sculptures reveal themselves as objects, buildings, and facsimiles of nature. They show their ability to recast the spaces around and ahead of them—as space shapers and shifters. Di Teana's theory of space, Tri-Unity. 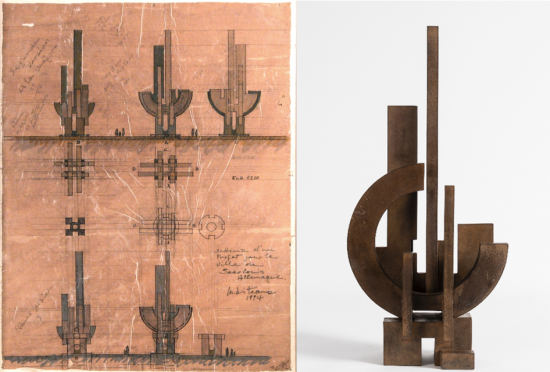 Marino di Teana, who was trained as an architect, concieved many of his sculptures as cityscapes, building them out in advance as architectural models. 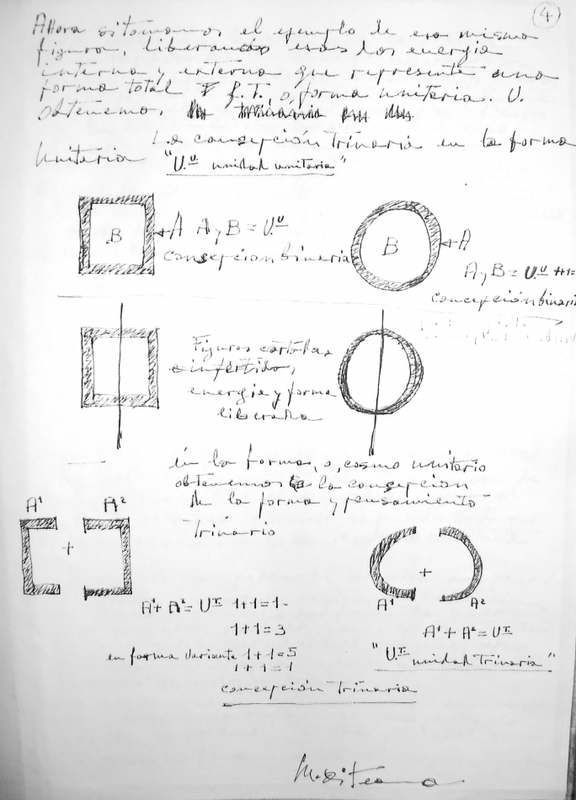 One of di Teana's meticulous sculptural-architectural drawings—plans which he frequently executed in the conception of his work. Di Teana's corten steel sculpture, Liberté before a Grosvenor Atterbury mansion in Southampton. Photo by Michael Mundy. 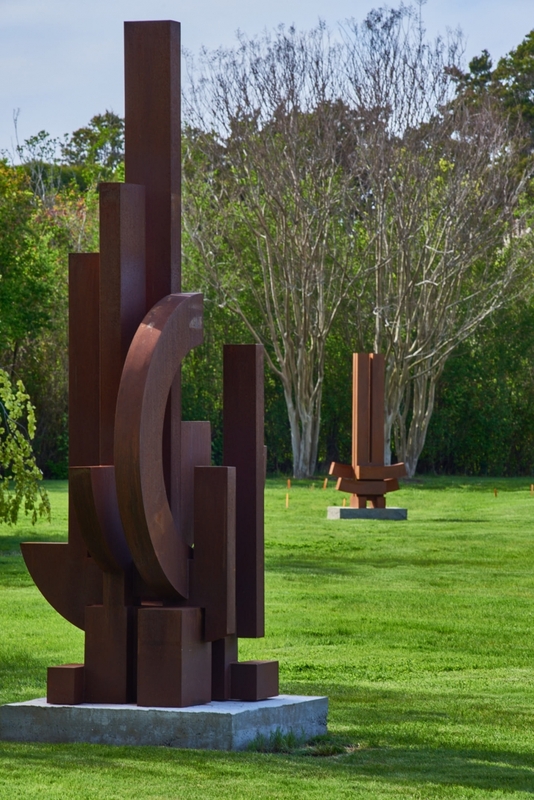 Di Teana's corten steel sculptures before a Grosvenor Atterbury mansion on an estate in Southampton. Photo by Michael Mundy. Large scale corten steel works on an estate in Southampton. Photo by Michael Mundy. Di Teana's corten steel sculptures on an estate in Southampton. Photo by Michael Mundy. Di Teana's corten steel sculpture, Lao Tseu, on an estate in Southampton. Photo by Michael Mundy. 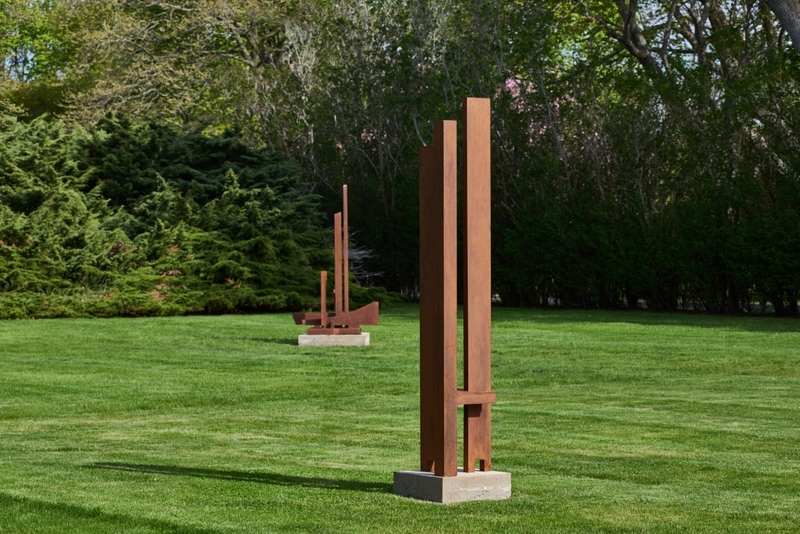 His sculptures, however, best express this idea of space—how space can itself act as an almost solid support, connecting and underpinning the components and become the focus of the structure. The patinated steel Liberté ("Clermont" Sculpture, France, 1980/2005), for instance, both as a monument, located at the Place Charles de Gaulle, Fontenay-sous-bois, France, and in its scaled-down, 30-inch-tall version, embodies much of di Teana’s vision and the range of ideas within his sculpture. We perceive the notion of negative space and see how it activates the seemingly static metal structure while controlling our eye and giving meaning to the larger components and the surrounding space. The cut-up geometric constructivist forms force our engagement, while simultaneously demonstrating di Teana’s own thinking—how the work itself comes to be. It is, in a large sense, art about art and art-making. It is like Le Corbusier and the way he could at once evoke drawing, sculpture, and architecture, and the way it all works in the world and acts on its viewers esthetically and socially. Adding to these attributes is an Asian sense of balance and elegance as seen in works such as Lao Tseu, an homage to the Chinese philosopher. The quiet composition is clearly at peace with itself without unnecessary decoration. Liberté in the foreground, Lao Tseu in the distance, on an estate in Southampton. Photo by Michael Mundy. Di Teana in his studio. Photo by Claude Gaspari. Barbara A. MacAdam has written about the arts for Newsday, The LA Times Book Review, and The New York Times Book Review, and has worked as executive editor of Art + Auction. She has served as an editor of New York Magazine and of Arts and Review: Latin American Literature. She was formerly the co-president of The International Art Critics Association, and is currently on the advisory committee for The Arts Arena. 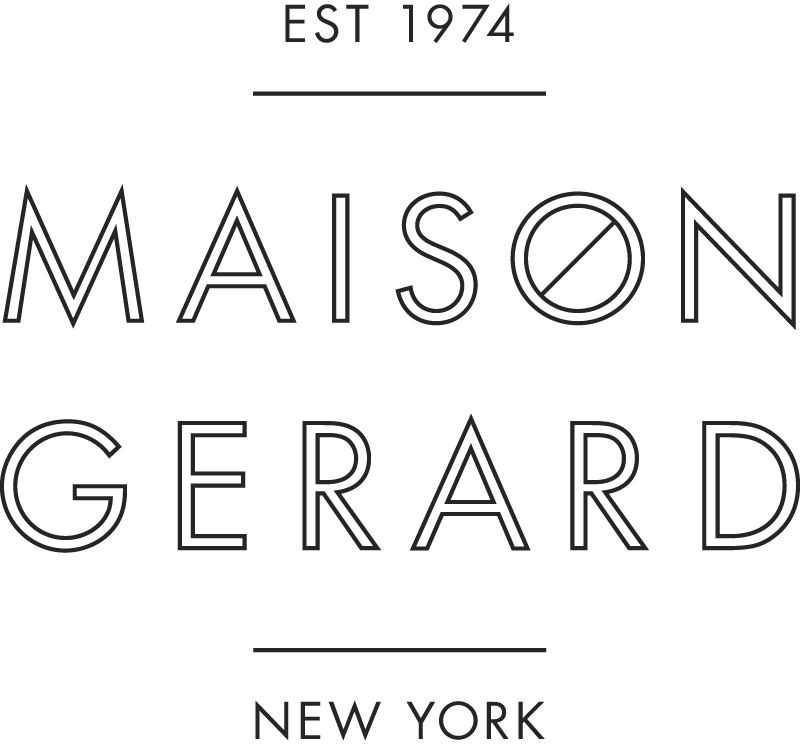 MacAdam is the co-executive editor of ARTnews.